Since so many of my readers want to know more about some of my secondary characters, I’ve created a new series called the Second in Command Series. Each book will stand alone and be about a secondary character in any one of my books no matter if it is contemporary, paranormal, western or medieval. The first book in the series is Pirate in the Mist: Brody, and on preorder for only 99 cents! Brody is Rowen’s first mate in the Legendary Bastards of the Crown Series. If you’ve read the series, you’ll know Brody disappears at the end of Reckless Highlander – Book 3, thrown into the sea by his own mutinous crew! Many readers have asked what happened to Brody. 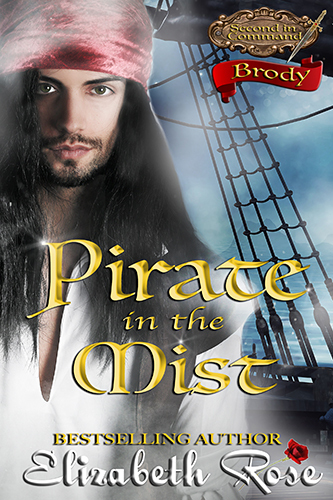 In Pirate in the Mist, you will find out his story. Pirate in the Mist was first seen in the multi-author collection, Mists and Moonrise which is no longer published. However, this is the extended and revised version of my book, and with a new cover! I have also added a surprise epilogue that you won’t want to miss. Release date is Oct. 5th. I’ve had many reader requests for Claude’s story from The Baron’s Destiny – Book 3 of my Barons of the Cinque Ports Series. That, as well as Orrick the sorcerer’s story from the Legacy of the Blade Series are slated for sometime next year. I would love to know which of my secondary characters from any of my series you would like to see have their own story. Enter the rafflecopter contest at the end of this post on my site by leaving a comment, telling me your choice. One lucky winner will win a $10 amazon gift card. If you haven’t read any of my books yet, there are a few other ways to enter the contest, but do leave a comment either way to let me know. One last exciting announcement: Since I haven’t had a new western come out for a while now, I thought it only fair I giveaway one of my westerns to make up for it. You can pick up your copy of The Gambler for FREE now thru Sept. 1st. See more books from the Cowboys of the Old West Series. This entry was posted in contest, Free book, Medieval Romance, Uncategorized by Lizrosek. Bookmark the permalink. While I have a couple of your books on my TBR list, I have not been able to read them yet. You are a new-to-me author and look forward to whittling down my book list to get to yours. Getting closer. Thanks for the giveaway and good luck everyone. I looked for your buttons but could not find them. Thanks for the chance. Debby, the buttons for social media are right under the Gambler book, and above the rafflecopter, or also at the end of my newsletter. They are colored circles. I would love to see Orrick’s story! Kim, I have something fun and special planned for Orrick. It has been a long time coming since the Legacy of the Blade Series was the first series I ever wrote. I haven’t read and of yours yet but I know i have some on TBR. I have been following you for some time and your books sound great. Thanks for the chance. Thanks, Bonnie, and I hope you have a chance to read some of my books soon! I haven’t read and of yours yet. I haven’t read any of your books yet, but I have to say that I’m quite intrigued by Brody’s story, so it looks like I have to get going with the LBoTC series soon so I’m all caught up and can dive (pun sort of intended) into Pirate in the Mist. Reese, LOL! You might want to also read Autumn – Book 3 of my Seasons of Fortitude Series before you read the epilogue on Brody. Thanks Joye! It is unanimous that Claude gets his own story. I haven’t had a chance to read yet so can’t say for sure, but I would also go for the “underdog” type character. Thanks for leaving a comment. And thanks for your suggestion! Orrick is who I would love to see have his own story. I have only read the first book in the elemental series. I think Asad (from the Dragon and the Dreamwalker) should have his own story but I see there is a Lord Asad in Bk 4 (though he appears to be a sailor rather than a knight) – is he the same character? Lesley, Yes, Book 4 features Asad as the hero. He already has his own story. Lori, I hope you check out one of my books soon. I also want to vote for Claude! Good to hear I’m not the only one. Thanks, Sue! Claude seems to be a favorite. I have not read any of your books yet. Thanks for the giveaway. Marilyn, I hope you decide to check out one of my books soon! I’m not sure yet, taking note though. I haven’t read any of your books yet so I can’t pick. But I would pick one that had the most intrigue and was tall, dark and handsome! Thanks and I hope you decide to check out one of my books soon! I would have to say Orrick also although I know there are some others that I would need to go back and look for.. Looks like you already have plans for him! Thanks so much! I want Narnie’s back story. She is such an important part of quite a few of the characters’ lives, I would love to learn more about her! Jessie, funny you should say that. While Nairnie will not have her own love story as one of the Second in Command books you will find out a lot more about her in Autumn – Book 3, (and another surprise later) so be sure to read it. I’m a newbie and excited to read these books! Katrina, I hope you enjoy my books. I have several of your books on my TBR pile but have not had the time to read any of them. Michele, I hope you get the time to experience one of my books. I want to see Claude get a story!